I know i haven't been to this thread in quite some time, but I wanted to let those who sent me squares that I haven't forgot about you, and that this blanket (once I get it put together) will be going to my aunt (my mom's sister and her best friend). My goal is to have it to her by her birthday this spring. Again, I apologize for not getting things put together sooner but I look at the squares daily and I never forget your kindness in sending them to me! Here are the 15 squares that I have! (13 were sent to me and I completed two of my own). They're all edged and a few have since been stitched together! Thanks again to everyone who sent a square--your generosity is very much appreciated. i don't know how come i didn't see this in you know, 2011, duh, but Id have helped... Glad to hear you are completing it though, and it's going to be gorgeous!!!!! Love that layout, you did a fine job with that! 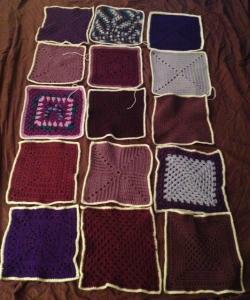 So...I was cleaning a few weeks ago and found TEN more purple squares. No clue how long they'd been hiding! 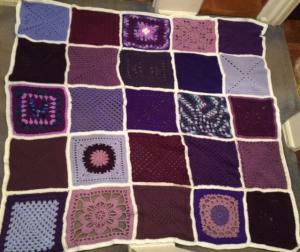 Needless to say, I have 10 more squares to edge in white and find a place for them in the ghan. Thank goodness that it's only about a quarter of the way stitched together! The comfortghan is FINALLY finished! Thanks again to everyone who helped me out (and thank you for your patience because it has taken me 3 years to complete this!) I'm giving the comfortghan to my aunt (my mom's sister) on Christmas. I know it will be really, really special for her. Hi Mandy, is this the ghan we contributed to in the granny square thread?? Im so very sorry to hear of you mom's passing, but know she would be very pleased with your effort, and talent. The squares go together so well..thanks for sharing the pic! This was actually something separate from my friendshipghan! 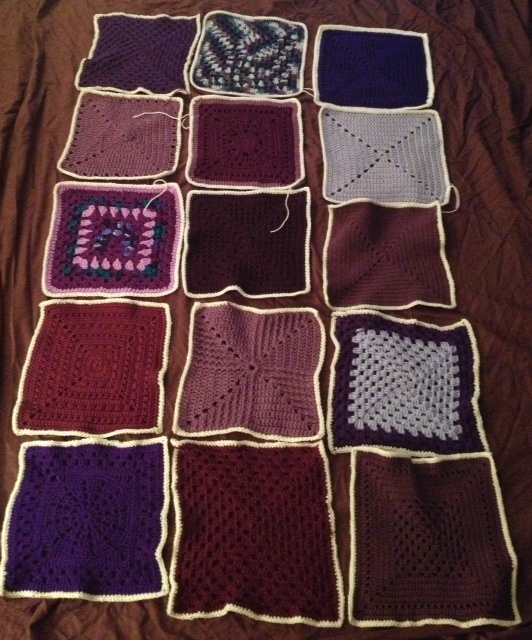 23 of these squares were donated and the other 2 I made.